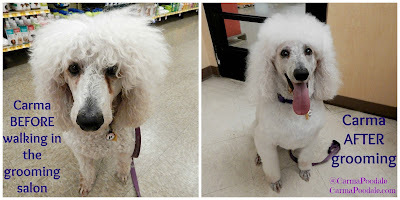 I, being a poodle used to love to get groomed but the older I get the more I don't like it. I like my nails painted and that is about it. I use the PetSmart® grooming services often, as you can see on my Facebook page. 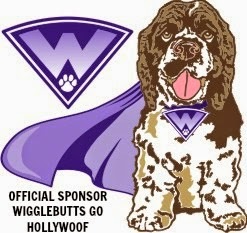 When Blogpaws® asked if we would be interested in applying for the campaign, we did. I am happy I got it because how often can you get paid for talking about something you love? 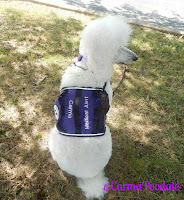 I am a service dog which is another factor of why I need groomed often. Service dog team etiquette that we follow is that I shall always be clean when I am on the job. Nobody wants to eat in a restaurant ,be in a grocery store or riding on public transportation and see or smell a dirty service dog. That looks poorly on a handler. I get baths often and I get a shaved every 4 to 6 weeks but they were mostly done at home. Ma's back can no longer take the long grooming sessions. If she puts me on a table , the standing too long gets to her and if I am on the ground, the bending over gets to her. She does pull my ear hairs and grinds and polishes my nails. She always says that a working girl has to look good out in public. You wouldn't want your co worker to smell bad while at work , would you? 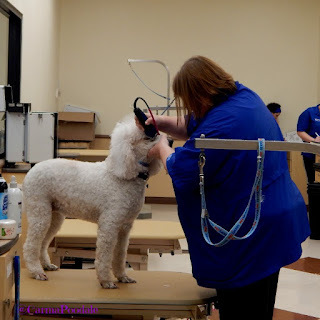 I have been to a few groomers and when PetSmart® opened I was one of their first clients but something happened. Ma thinks one of the dogs may have made fun of me or something because I did not want to go back to them. That left ma out of options. She had discussed it with the grooming salon and everyone there said I was a good girl, I didn't give any trouble and I was a easy groom. It puzzled ma but then when I went to another groomer the same thing happened. I refused to walk in the door.This made ma come to the conclusion that I didn't like to go to a professional groomer and I wanted her to groom me because I can lay down and nap while she is doing the job. At a groomers, I have to stand up the whole time. Yes , I can be a lazy pup. Ma explained to the PetSmart® groomers what she had thought maybe it could be. The salon manager, Emily suggested starting off with a face and feet groom. Its a walk in service, I didn't need a bath and ma could sit in front of the salon while I had it done so I could keep a eye on her. Ma thought maybe that would work but earning my trust was another story. 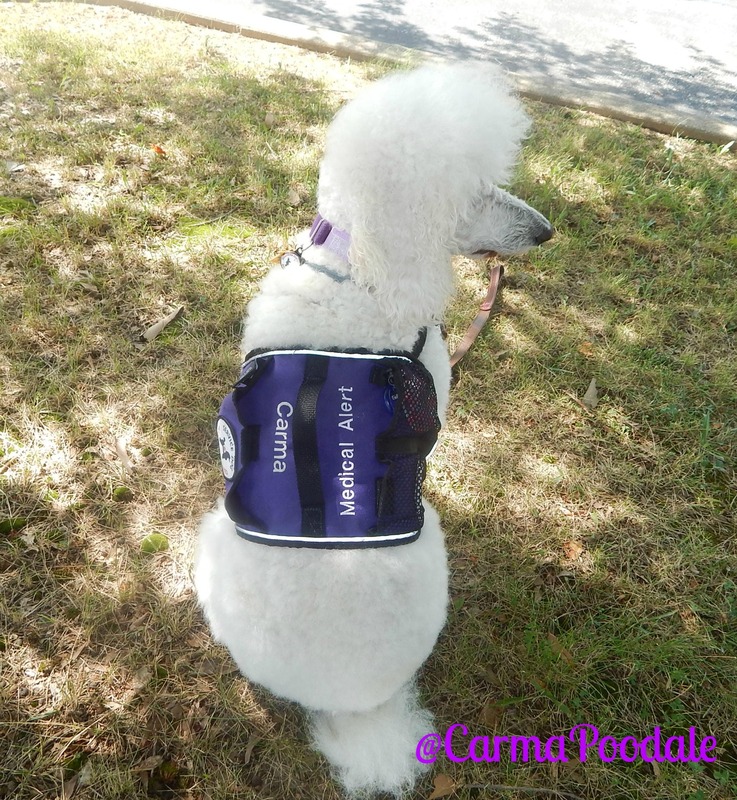 Trusting that I could keep an eye on ma because after all I am a medical alert service dog. For months, whenever Ms. Emily seen me in the store she would make a point to come out and say hi. After a few times of saying hi, she started asking to pet me. I let her on ma's command but you could tell I was uneasy. Ms. Emily then started coming out to sit on the floor, just to talk to me. She didn't try to pet me , she just spoke softly to me and explained that they needed to start grooming me because of ma's back. She spoke to me like I was a person and not a dog. THAT meant a lot to me and ma. I finally started approaching Ms. Emily and letting her pet me. One day she touched my face and my feet and asked me if I would just like to have a touch up. I was looking a little straggly so we went to the salon and ma told me that she would sit on the bench so I could see her. Ms. Emily got my face and my feet done in no time. It would have took ma a hour or more to do that task because of the breaks she would have to take. I thought to myself that wasn't too bad. I could handle touch ups and boy did I get a lot of compliments on my way out the door!! It was finally time for a full groom. Ma booked my appointment while she was in the store but now PetSmart grooming salons have online bookings. We go to PetSmart every week. Its a place Scooby enjoys going and with fish, guinea pigs and sissy spaniel needing food weekly , we make it a fun trip with a quick run in the field afterwards. Ms. Emily booked me for a express groom and that is for dogs that don't like kennels, gets antsy, etc and it means they get the job done faster without putting the dog in kennels so we are blow dried by hand and it takes about a hour off of the time that a dog is separated from its owner. I REALLY appreciate that service. If ma has a doctor appointment at 1 0'clock, I can be bathed and groomed in time for the appointment. I like that the windows are there too. People walk by and I see them stop to smile at me. Some stand and watch the grooming. Once ma was waiting on me to get my face/feet done , a lady and her daughter stopped and were saying how beautiful I was and I was being perfect on that table. I wasn't fighting the groomer and I was standing statue still. Ma just smiled. Ma and the lady got in a conversation about the grooming salon and ma told them all that she liked about it. The lady said she would definitely give them her business. When it came time for me to work on this campaign, ma didn't worry about giving ma a bath for a couple weeks. Trust me, I was ready for a grooming! I stunk! I like to say I worked up a "Poodle Stank". Between Scooby always laying on me, playing in the yard and mole digging in the big field, I can work up a Eud de doggey stink. Ma booked my appointment for 9AM. I got there thinking I was having a face and feet done but I was wrong! I got the whole shammoozle. I won't complain. I was looking pretty ruff. Flat floof, runny eyes from mole digging, dirty feet, the whole doggie package. Ms. Emily sure made me feel and look so much better! I felt like a million bucks. I got the Top Dog add on with the whitening shampoo and ma bought my favorite seasonal scent, Sugar Cookie! I feel bad that you all don't smell how good I smell. Trust me, parents can't keep their hands off of me because I smell so good. 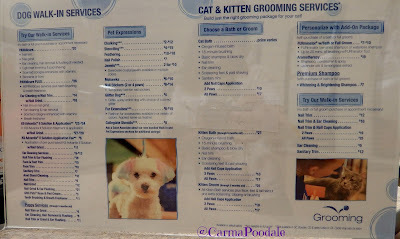 With all the different add ons, walk in services for dogs and CATS, you really can't go wrong. As for the price? Those very depending on size, coats,services you choose but considering all the other places in town charge anywhere from $95-$170 for a standard poodle, the $54 bath and groom is worth it. Add ons are extra but it was only a few dollars more for the whitening shampoo. I know many of you have questions about safety. I am trying not to make this post way to long but there is important stuff I feel you want to know. 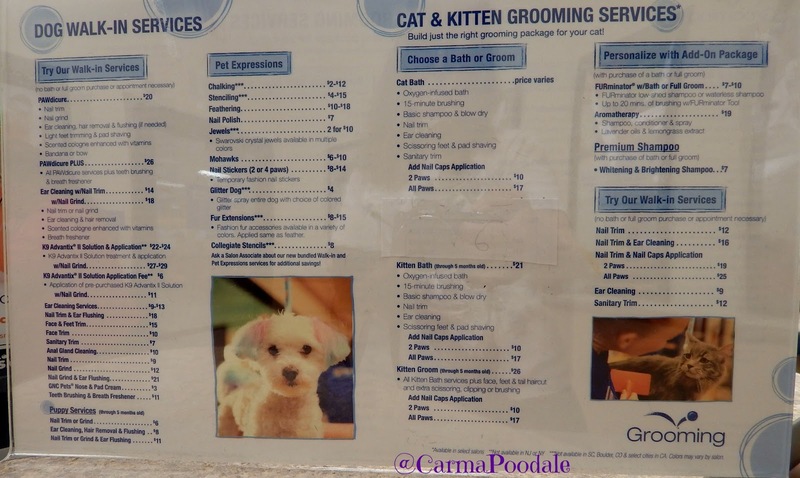 Instead of writing it all out, my pawsome groomer explained it all and we taped it. Before I left the salon, Ms Emily gave me some bows in my hair. Got to let everyone know I was a girly girl. To wrap it up, I think my groomer is awesome. She is the only groomer I will let handle me. She put the time in to earn my trust and I am grateful for that. I even got a report card with coupons attached for treats and stuff. I always get a A+ but they also list things that they find to bring your attention to. Such as I have one of my little sebaceous cysts forming in my paw up inside the toes that ma didn't know about. -All pets need current rabies vaccinations and proof of vaccination from their vet. -Rabies vaccination needs to be administered 48 hours prior to service. -We do not perform services on pets 8 weeks or younger. -Customers cannot go behind the double doors separating the Salon lobby from the grooming area. 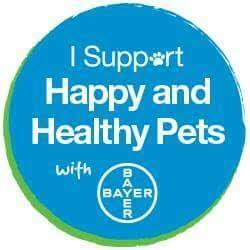 This is for the safety of our pets and associates. 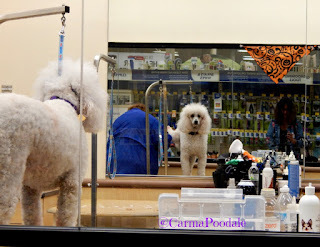 I hope you follow PetSmart on Facebook, Twitter and Instagram . You never know if my photo will be on there! You can share photos of your pets with them too. They are all about Pets. I just know when I got home and ma told dad I had a sugar cookie treatment, he picked me up, sat down and started kissing and smelling me. He told ma she must have brought home the wrong poodle because the one that left was beige and stunk. The one that came home was white and smelled good. 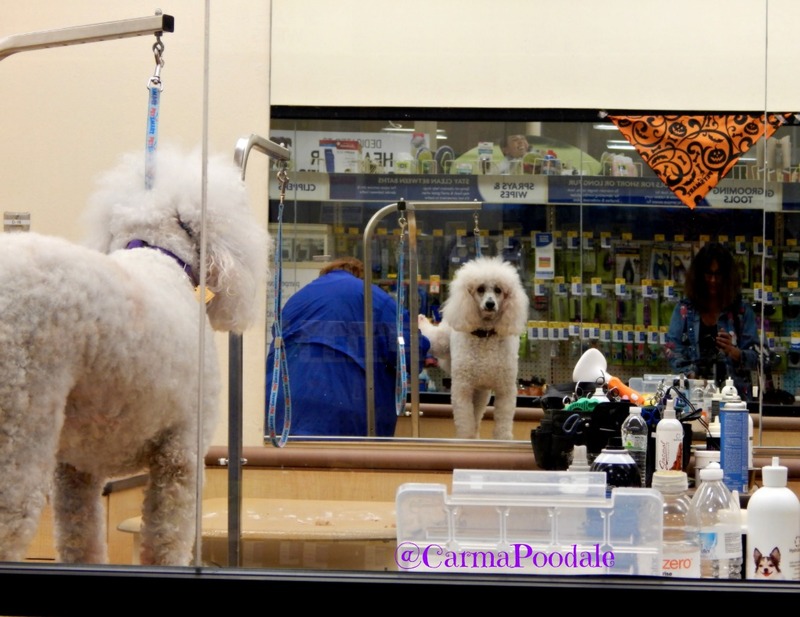 I love my groomer, Ms. Emily and I love our local PetSmart! 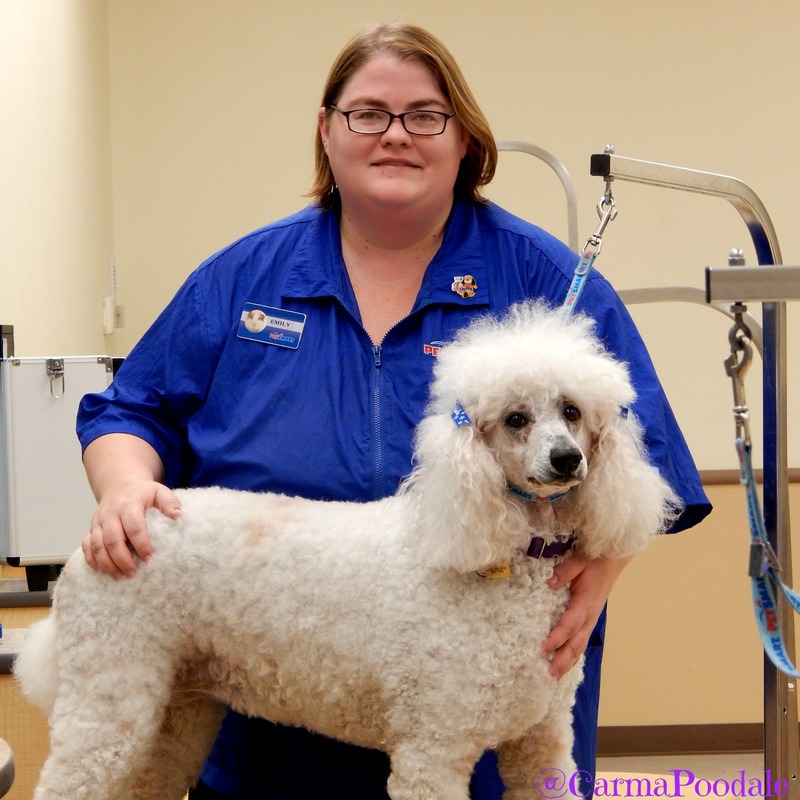 Do you use you PetSmart grooming salon? You furs look much more under control in the after shot! Bailie enjoyed her trip too, but we will post about that next week. I felt like a movie star when I came out of that salon. People were oohing and aahing at how pretty I was. Carma, you look so pretty. 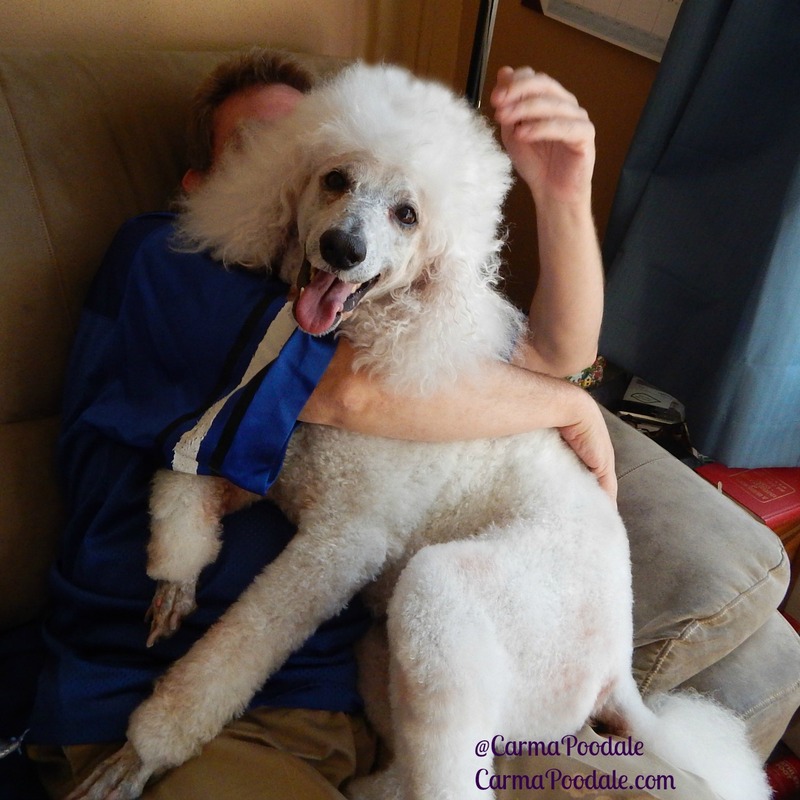 ♥ I love that your groomer won your trust before you had to go under the scissors! BOL! I once knew a Poodle that had its feelings hurt when someone laughed at its new haircut. The poor thing went into the bedroom and sulked. You don't have to worry, though, you look marvelous. We are really sensitive. I know after I had to get my floof (top knot) cut off when I was a year and a half old , some kid laughed at me while we were in a pet store. I got so sad that ma said she would never do it again. Carma, you are beautiful, as always! Great post! It is wonderful that Ms. Emily took the time to gain your trust. That is so important. You look great! I trust PetSmart to do a good job with my dogs too. Bow wow this looks great - love the before and after - and a fancy Poodale deserves fancy grooming!